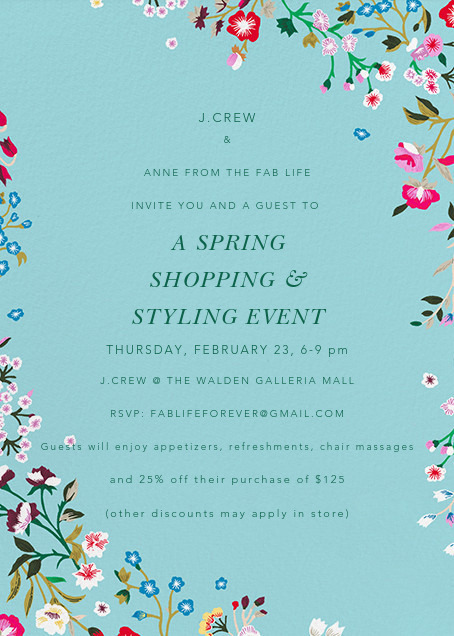 The Fab Life & J.Crew Spring Shopping Event! I know we’re still buried under snow but there’s always room in the closet for spring clothes. At this time of year, I’m just about done with my winter clothes and while I know I still have another month or two to be wearing sweaters – looking (and purchasing) spring clothes gets me ready for warmer weather. We are going with a “girls’ night out” theme for this event and the store will have savory/sweet crepes, refreshments and chair massages from Phoenix Rising Therapeutic Massage. What’s better than shopping and massages and a little help putting some spring outfits together? The store will be offering a special discount of 25% off your purchase of $125 but any better existing discounts in store will apply. AND if you’re a student or a teacher – bring your ID and you can receive an extra 15% off. The J.Crew at the Walden Galleria Mall features Men’s, Women’s and Crewcuts so you can peruse for yourself or the kids. You can check out the Facebook event page or email fablifeforever@gmail.com to RSVP. I hope to see you there! !